SCERT Odisha has been released the Odisha SCERT course wise Examination date and Odisha SCERT Admit Card 2019 at his official website samsodisha.gov.in. Now candidates can be download Odisha CT entrance exam admit card 2019 from the official website. Friends, the Odisha SCERT Entrance Exam Admit Card 2019 has been released last two days but candidates may be cannot download admit cards due to some technical problem. I think the problem solved now and you can download your admit card from its official website www.samsodisha.gov.in. The candidate can download admit card by logging at SAMS portal and the exam schedule also released, the examination process will be running from May 219. The candidates can download admit card for CT,B.Ed entrance examination in between 5th May 2018 to 15 May 2019 (Expected). 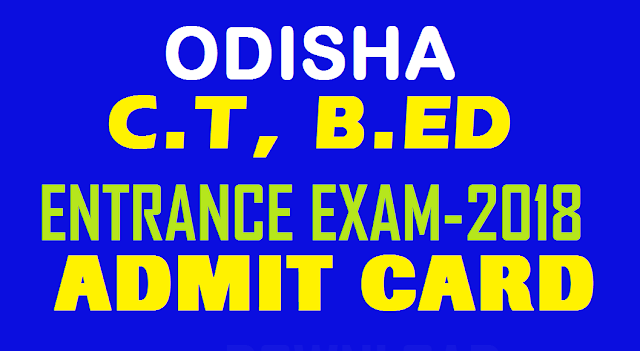 The candidates are advised that they should download their admit card before 10days of the exam and read carefully instruction regarding for Odisha SCERT entrance exam 2019 which you should follow at the time of examination. These instructions are Firstly you should carry a Valid Identity proof like Aadhar Card and is required to produce near the entry time to the exam hall as well as to invigilator in the examination hall. Second Instruction is if your uploaded Photograph in the admits card not match the actual photograph, you should be handed over a fresh photograph for authentication at the examination center. The third Instruction is candidates are required to produce admit card along with Identity proof and candidates will be present before 1 hour at examination hall. In your SAMS SCERT Odisha Admit card 2019, the place of your examination center is mentioned and also your name, gender, father name, Roll Numis are mentioned on your admit card. I hope like this post very much and please share this post to your friends and relatives. Thanks for visit and keep visiting for more updates.